Not on the network, but let’s start our tally of current WWE employees versus goners – D. Bryan still with the company (barely), but DiBiase and Maryse are gone, so it’s 1-2. U.S. Champion D. Bryan in the dark slot. Ya. Stryker, Cole and Lawler again. Cole has his Slammies. Remember when the Slammies were real, or something like that? Of the four performers involved in the first match, yes for Kofi, yes for Dolph, yes-ish for Swagger, and no for Vicki, so it’s 4-3. A pretty average three way and a pretty average ladder match with a super flat finish of Dolph picking the title up off the ground that was dropped by Kofi and Swagger. Natalya is the only one still remaining, so we’re at 5 in and 6 out. I’ve haven’t heard as many hi-yas in one place since my 6 year old birthday party where we all were dressed as ninjas. Stryker just sounds like a complete dork. I enjoyed the painted table because I have no idea if it was supposed to be flattering or insulting to LayCool. I see why they haven’t done another one of these since. The double Sharpshooter by Natalya actually looked pretty good. Natalya having to do the cross body off the top because the table didn’t break made the ending at least enjoyable. Santino is not wrestling anymore, Kozlov is gone, Gabriel quit, Slater is a jobber, Harris is now Bray Wyatt, and Axelmania is, well, unclear at best. That puts us at 8 on the roster and 9 not, and the biggest current player of this match is Husky Harris. Wow, Michael Cole really stepping up his annoyingness putting himself over in this one. Nothing I like more than hearing the announcers talk about how great they are personally. Sheamus is still around, and Morrison is doing stand up comedy. Who came out better? 9 still here, 10 gone. Let's toss the announce team into our tally, so we have Cole and King still around and Stryker gone. Now we’re even at 11. Pretty wild ladder match. I like when they build stuff out of the ladders. Do you think Morrison really did Parkour? Like in his free time, would he go run in the park and jump off of picnic tables? Or did he just go to the gym like a normal person. This is actually a dang good match. Really fun stuff here. Miz is still around and now wearing a cape, Orton is around but injured, and A-Ry? MIA. I can’t count him as a current roster member… Well I just checked the WWE Superstars page, and he’s there, so I have to count him. 14 yes – 11 no. Oh wait, I forgot to add Josh Matthews to the no list. 14-12. I once pitched a tag team idea for Zach Ryder and Alex Riley. They would have been called A Ri to Z Ry… And by pitched I mean, said to myself alone in the car and giggled. Did you do your Randy Orton body research from last week? One day when I figure out how to screen shot something I’ll do it myself. Nah, I won’t. Regardless, he looks better in 2010 than 2009. Bigger for sure. And it looks like he finally got those wonderful tattoo sleeves completed. A Ry took the table bump and Miz put a lifeless Randy Orton through the remains, and Mike Chioda didn’t see it because he had been bumped. Chioda saw the replay on the big screen and restarted the match. Let’s start the 90-second timer… Way less. So now Orton falls off the apron and into a table and the match is over. So the ref can use replay but only if they happen to notice it. It can’t be done officially, I guess. Cole was yelling about how instant replay is illegal. They showed a replay of Chioda watching the replay. Whoa! Trippy. Rosa Mendes and Del Rio chatted it up before the match. Strangely, they are both still on the roster. Edge is gone, Rey is gone, Ricardo is gone, Kane is now two people, but he’s fired. Whatever. 17 yes and 15 no. This is just after the “Edge is a psychopath father torture” angle. Edge took a ladder and threw it near the announcers and you could see Stryker do the “stop short” arm move for the King. That was nice. Then Stryker says that Edge chose the biggest ladder because of his experience. Ok? Some pretty inventive stuff here. Rey jumped off one of the prop tables that were hung over the stage. Ricardo took a big bump from Kane. This was a heck of a TLC match. Just sort of brutal and realistic. When the spots get too inventive, it takes me out of it. It also takes me out of it when at the start of every ladder match the guys have to stare at the title longingly. Hellacious bump by Del Rio coming off the big ladder through a table out of the ring. Kane’s back up and looks to have a trickle of blood on his head. Better go to that wide shot. Edge spanked Kane with a chair. Kane took a pretty solid bump to the floor through a table after a spear by Edge. Dashing Cody Rhodes came out to speak. He’s still on the roster, sort of. 18 and 15. Fat material. Jowl puns. Wow. Michael Cole’s fake laugh is sickening. “Irritable Jowl Syndrome.” Haha! Good stuff Cody. I enjoy the old school heel running down the audience, but this material is “Boy Meets World” level bad. Then the Bellas came out as elves and Big Show as Santa. Big Show is out to plug Knucklehead. I hope that ends up in my stocking this year. Big Show’s finish is a punch. How is he not the Champion on an amazing undefeated streak if all he has to do is punch? CM Punk comes to the ring to announce. He’s out. Cena is still the man even though he’s off TV for a bit, and Barrett probably wishes he were fired a long time ago. 23 yes, and 16 no. There are literally dozens of chairs at ringside and Cena can’t seem to pick one up. “We Hate Cena” T-Shirt guy in the front row. Speak for yourself! This match is just silly. Chair use in this match is idiotic. Wade continually tries to decapitate him but keeps missing, and then gently swipes him on the side later when he had him dead to rights. Cena “knocked out” Barrett, then poured cold water on his face to wake him up, just so he could zoom him down the ramp on a rolling chair into the propped up ring steps. That’s really what happened. Now I’m supposed to take this match seriously. Oh, remember earlier when Cena knocked out all five other Nexus guys earlier in the night? He’s concussed a half a dozen men this evening. Cena wins by giving Barrett an Attitude Adjustment onto 8 chairs. That match was pretty stupid. It had a zany finish of Cena putting Barrett under a protective table, and then pulling down the prop chairs and they all fell on Barrett. Summary: This was a much better show than the year before. Actually, I just went through the card again, and I’m wrong. It’s not as good. The terrible stuff was just the dirt worst, and there were some cringe worthy matches. 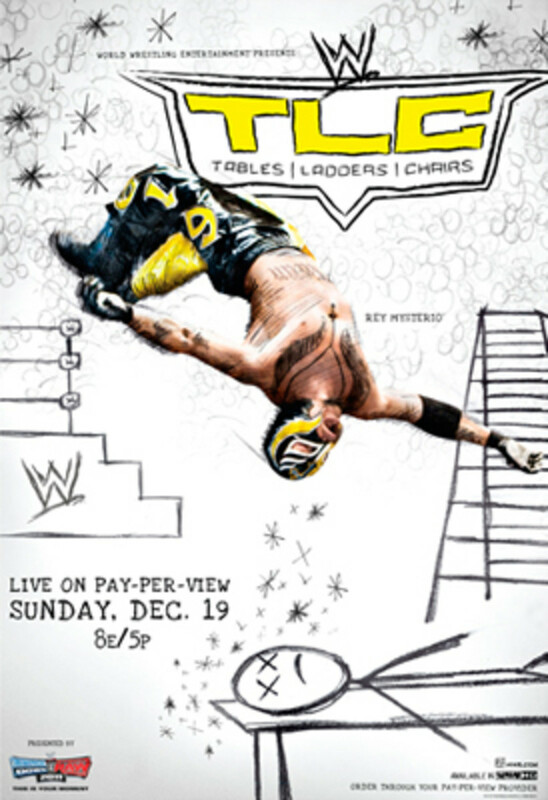 The TLC match was really good. Go watch that.